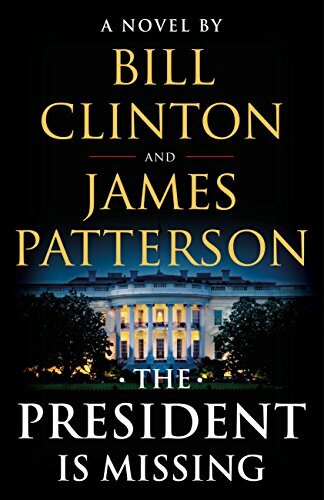 The publishing event of 2018: Bill Clinton and James Patterson’s The President Is Missing is a superlative thriller . . . one that must not be missed. The President Is Missing confronts a threat so huge that it jeopardizes not just Pennsylvania Avenue and Wall Street, but all of America. Uncertainty and fear grip the nation. There are whispers of cyberterror and espionage and a traitor in the Cabinet. Even the President himself becomes a suspect, and then he disappears from public view . . .
Set over the course of three days, The President Is Missing sheds a stunning light upon the inner workings and vulnerabilities of our nation. Filled with information that only a former Commander-in-Chief could know, this is the most authentic, terrifying novel to come along in many years. The book captured my attention from page one and I could not put it down. It is brilliantly and beautifully written with drama, suspense, and insight that only a few people in this world can have. I almost wish that Bill Clinton’s name was not on the cover of the book because it seems that people are polarizing and politicizing the whole thing. Regardless of who wrote the book, if you love a great novel of suspense with historical context, if you are a political junkie who enjoys novels, if you like to binge on exciting drama and suspense, then you would probably enjoy reading this book. It is a thick book, over 500 pages and 100+ chapters that will keep you reading page after page, chapter after chapter. It feels solid in your hand and your lap. It will keep you entertained for hours, if not days. This novel is quite lengthy at 528+ pages, but it’s a “fast-read”, in fact I knocked out 200+ pages in just one sitting…most likely to finish tomorrow! What I’ve read so far is really quite fun, the story flows swiftly and it’d make a pretty good movie too. Ironically, it’s Dennis Quaid that narrates the audiobook version and I believe he’d be great as the main character (President Duncan). Some aspects of this fiction are somewhat thought-provoking, especially in light of the current Washington DC climate combined with cyberterrorism. I listened to the NPR review/interview with James Patterson & President Clinton where they discussed their efforts to maintain authenticity wherever and whenever possible. Much of the information (plot) could and probably will happen; might be happening right now. This fictional account of the white house inner workings, secret service, etc… is very contemporary but not too “over-the-top” with techno-jargon mumbo jumbo. I seldom give novels a 5 – saving that for true literature; I make an exception in this case because I truly could not put it down. The writing is Patterson at his better than best and the insights and details reveal the insider knowledge that comes from Clinton. While it is a great read, it is also eye-opening. Our world is a scary place these days.